Baton Rouge – April 22, 2014 – Lamar Advertising Company (NASDAQ: LAMR) is celebrating Earth Week 2014 by partnering with Recycle Across America (RAA) and notable celebrities to announce a simple solution that will deliver a profound impact on the environment and the economy – society-wide standardized labeling for recycling bins. For Earth Week, Lamar Advertising Company has donated space on 600 digital billboards across the U.S. to feature Recycle Across America’s “let’s recycle right” campaign, which introduces the standardized labels and includes celebrities such as Kristen Bell, Angie Harmon, Stana Katic, Ian Somerhalder, Josie Maran, Alanis Morissette, Anthony Mackie, Gabby Reece, AnnaSophia Robb and Chris Salgardo, the president of the philanthropic brand, Kiehl’s Since 1851, who have donated over 200,000 standardized labels to K-12 schools through the U.S. The campaign also combines social media and digital out-of-home to engage consumers and promote the importance of recycling right. Recycle Across America will ask people on Twitter to pledge to “recycle right” using standardized labels. 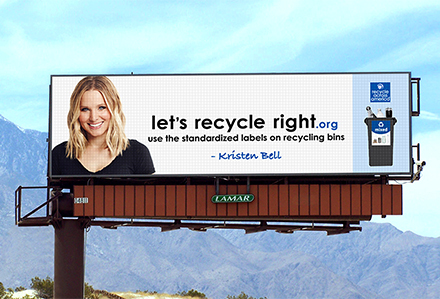 Those who re-tweet the pledge from @recycleacrossam or tweet with #LetsRecycleRight will have their twitter handle featured on digital billboards nationwide. 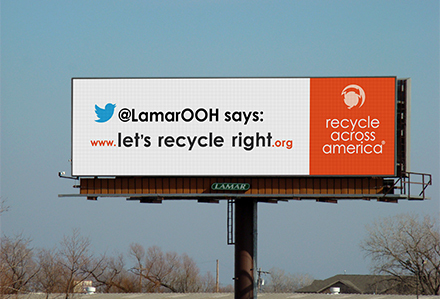 Recycle Across America’s “recycle right” campaign running on digital billboard space donated by Lamar Advertising Company. 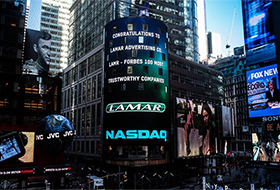 The Recycle Across America campaign will run on Lamar Advertising Company’s digital billboards nationwide through April 27, 2014. For more information, please visit www.letsrecycleright.org. To learn more about Lamar’s environmental initiatives, please visit www.lamar.com/About/GivingBack/Environment. 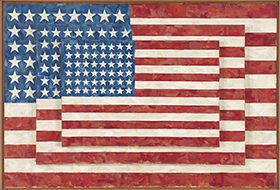 This summer, images by dozens of famous American artists will be plastered on 50,000 advertising displays from digital billboards to bus shelters, an initiative by leading museums and the billboard industry to create one of the largest outdoor art exhibitions seen in the country.